NASA's Interface Region Imaging Spectrometer, or IRIS, has revealed fine detail in prominences within the sun's atmosphere (the red swirls shown here), challenging the way scientists understand such events. During its first six months in space, NASA's IRIS telescope has snapped stunning images of an obscure layer of the sun, revealing previously unseen violence and complexity in the lowest slivers of our star's atmosphere, scientists say. The IRIS Observatory launched in June and its name is short for Interface Region Imaging Spectrograph. The small spacecraft is designed to collect data on the interface region, a little-understood area spanning the 3,000 to 6,000 miles (4,800 to 9,600 kilometers) between the solar surface and outer atmosphere, or corona. IRIS snaps high-resolution images every few seconds and can capture areas of the sun as small as 150 miles (241 km). The spacecraft is also equipped with a spectrograph that analyzes the sun's light, splitting it into various wavelengths, which can reveal variations in temperature, density and velocity. 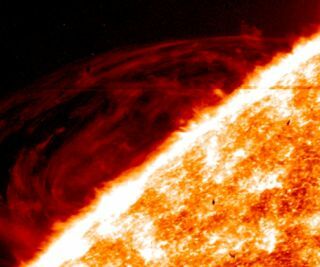 Supercomputers on the ground help check this data against current models of the sun. "We are seeing rich and unprecedented images of violent events in which gases are accelerated to very high velocities while being rapidly heated to hundreds of thousands of degrees," Bart De Pontieu, the IRIS science lead at Lockheed Martin, said in a statement. "These types of observations present significant challenges to current theoretical models." In particular, DePontieu has been focusing on IRIS's data on two solar features: prominences and spicules. Extending above the sun's surface, prominences are cool, giant loops of solar material that can lead to solar storms when they erupt. DATA from IRIS revealed that highly dynamic and finely structured flows sweep through these prominences, mission scientists said. Spicules, meanwhile, are huge fountains of gas that shoot away from the sun's surface at 150,000 miles per hour (241,400 km/h) and may play a role in heating up the corona. IRIS data has allowed researchers to see for the first time how spicules evolve, according to NASA. niversity of Oslo in Norway, said of IRIS's data on prominences and spicules. "By seeing something we don't understand we have a chance of learning something new." IRIS is part of NASA's Small Explorer program, an effort to fund missions that cost less than $120 million. Designed by Lockheed Martin, the spacecraft is just 400 pounds (181 kilograms) and measures just 7 by 12 feet (2.1 by 3.7 m) with its power-generating solar panels deployed.